Yellow Cake with Brown Sugar Frosting | how 'bout some cake? This cake is good. If you don’t believe me, you can ask one of my several friends who polished it off. With their fingers. In public. In broad daylight. Decent, self-respecting people… except when under the influence of cake. It’s the frosting that really makes it. Homemade brown sugar frosting that just melts in your mouth. But I’m getting ahead of myself. You start by making cake. I used a box of yellow cake mix. If I were going to do it again, I’d make cupcakes instead. The frosting hardens quickly, making it very difficult to coat the entire cake in a smooth layer of frosting (I failed, as you saw). Cupcakes would eliminate that problem. 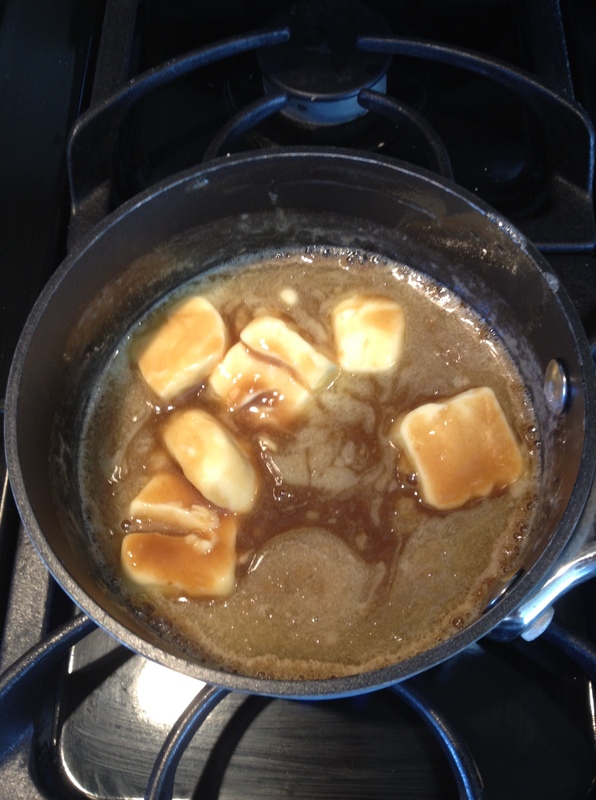 Melt those down, stirring, until the butter is melted, sugar is dissolved, and it’s just starting to boil. This happens quickly, so you’ve got to stay on top of it. As soon as it starts to boil, pour it into a bowl and add a cup of powdered sugar. Mix, and add another cup. Continue until you’ve added 3 1/2 cups of sugar. 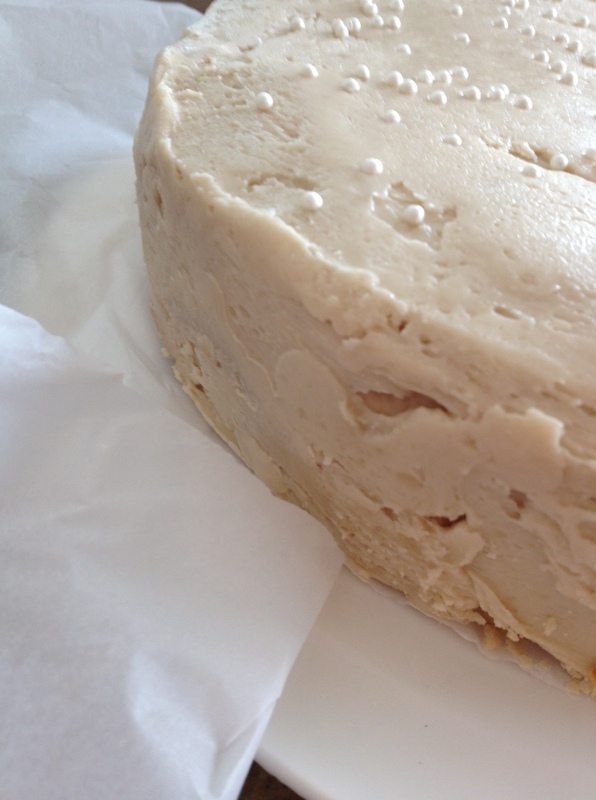 It will be a nice, firm but spreadable consistency. 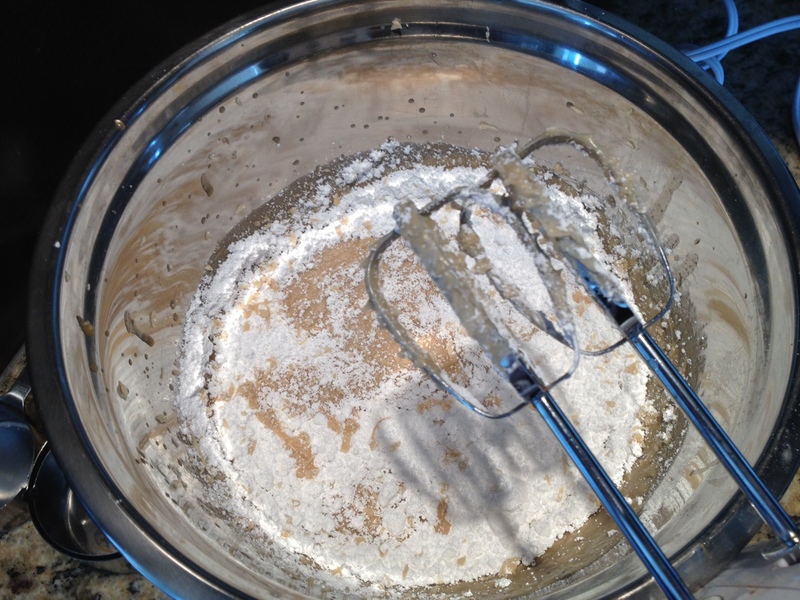 It will start to harden, but just mix it again for a second and the softness will return. Since mine was a layer cake, I had to build it, putting frosting between the layers like mortar. Then I frosted the whole outside. 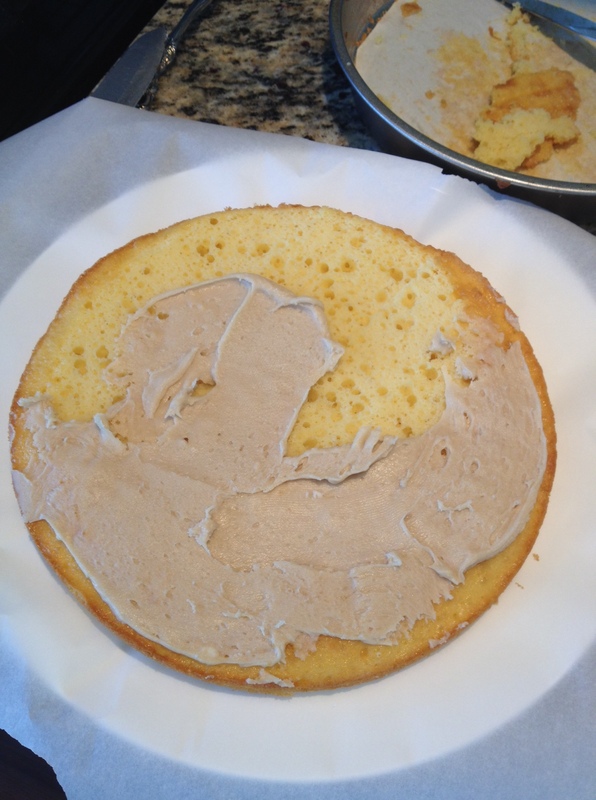 It was tricky, since my frosting had already been cooling a while. But I did my best. To compensate for the amateur frosting job, I created some fancy decor. 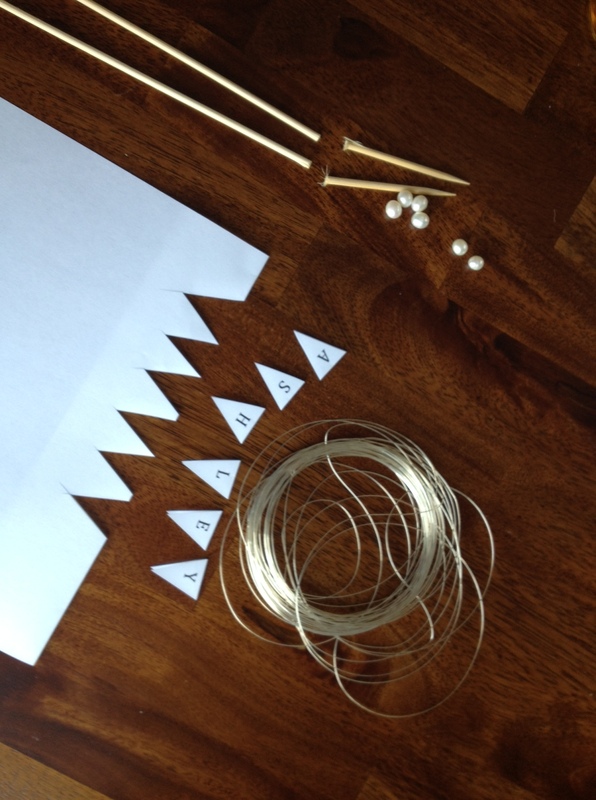 I used Microsoft Word to print out the letters of her name, then used some jewelry wire, fake pearl beads, and broken-off shish-ka-bob skewers (and a glue stick) to make a cute little banner. That made me less embarrassed to give it to her with its shoddy frosting job. But once everyone tasted it, it was obvious that there was nothing to be embarrassed about! P.S. 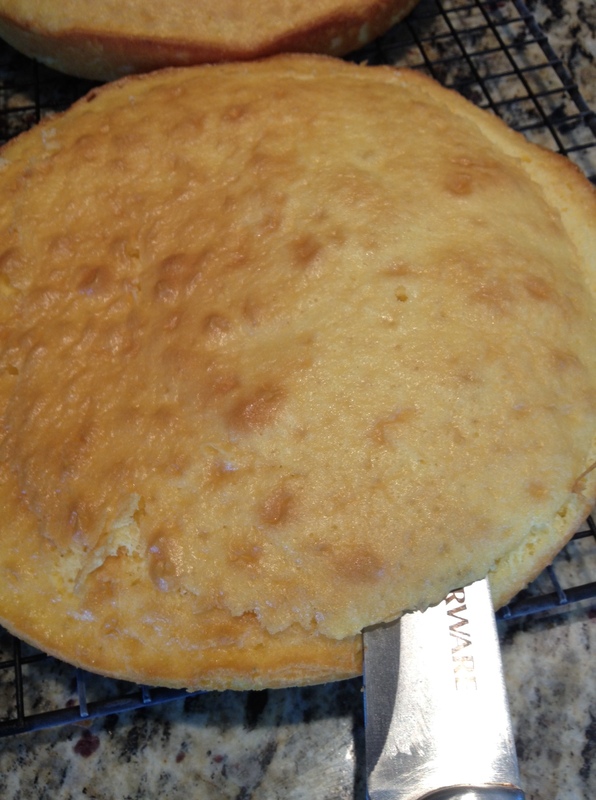 This is actually the first time I’ve ever posted a real cake on my blog (which is ironic to me, considering the title). Kinda exciting, right? This entry was posted in Food & Recipes, Indulgences and tagged birthday cake, birthday cake recipe, Brown Sugar frosting, brown sugar frosting recipe, cake recipe, cake with brown sugar frosting, dessert, dessert recipe, recipe. Bookmark the permalink. 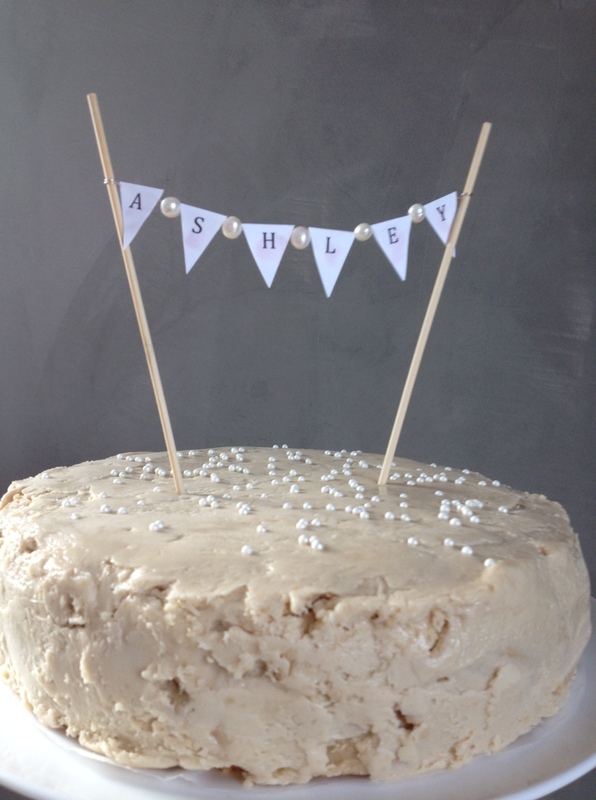 I have been looking for a brown sugar frosting recipe, so this is PERFECT! Honestly, as much as I love cakes, they are so hard. Mine usually come out ugly-but-delicious. Which is fine, seeing as they don’t last long anyways. I am the worst at frosting anything, so you did an awesome job in my book! I cannot wait to try this recipe! The banner was such a cute idea too! It looks too good to eat! Brown sugar frosting sounds incredible! What an adorable cake and that bunting is just too cute! I’m planning on making a cake for my husband’s birthday next month and I think I might top it with a bunting (we’ll see how it turns out for a first try lol).